Lichtman et al. (2008) assert that more than 60 prospective studies and numerous meta-analyses have linked depression with reduced prognosis for individuals with coronary heart disease. According to Celano and Huffman (2003), between 20% to 40% of patients with cardiovascular disease meet the criteria for major depressive disorders or have significant symptoms of depression. Chronic depression has been associated with the progression of coronary artery disease, decreased health-related quality of life, poor physical functioning, recurrent cardiac events, and a 2 to 2.5 fold increased risk of mortality. Depression often impairs adherence to health behaviors and promotes adverse physiological effects including inflammation, endothelial dysfunction, platelet hyperactivity, and autonomic nervous system abnormalities, all of which can cause adverse cardiac outcomes. Pharmacologic and psychotherapeutic interventions appear to be safe and effective at reducing depressive symptoms in patients with cardiovascular disease and may improve cardiac outcomes. Several additional researchers (Glassman, et al. 2006; Lespérance, et al. 2007; Huffman, et al., 2011) carried out studies of depression in patients with CAD. They concluded approximately 50 to 70% of patients hospitalized for an acute cardiac episode met the criteria for depression preceding their cardiac admission. 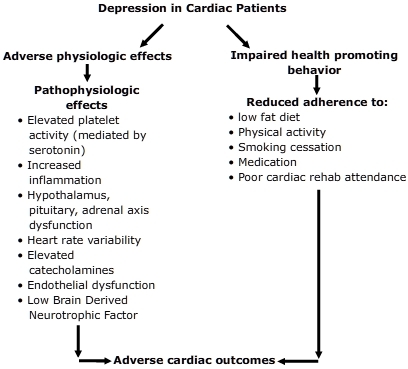 Huffman, Celano, Beach, Motiwala, Januzzi (2013) developed a model describing the potential mechanisms linking depression and cardiac disease (above). They concluded depression in cardiac patients resulted in the following physiological changes: elevated platelet activity, increased inflammation, hypothalamic–pituitary–adrenal axis dysfunction, decreased heart rate variability, endothelial dysfunction, and Brain-derived neurotrophic factor (BDNF). Depression also impaired health promoting behaviors such as adherence to low-fat diet, exercise, smoking cessation, and medication adherence. Additional researchers found patients in the American Heart Association Heart Failure (HF) stages C and D have additional challenges with depression. Patients with heart failure and those undergoing implantable cardioverter-defibrillator (ICD) placement have an increased risk of depression. They exhibit a combined score of 56% for depressive symptoms and MDD (Rutledge et al., 2006; Magyar-Russell et al. 2011). In addition, patient’s undergoing coronary artery bypass graft surgery (CABG) show increased symptoms of depression (Tully & Baker, 2012). The depression has been shown to impact negatively on adjustments to devices and recovery from surgery. Foss-Nieradko, Stepnowska, & Piotrowicz (2012) conducted a prospective comparison on the effects of chronic depression, incidental depression, and no depression on outcomes after coronary artery bypass grafting. After a two-year study, they found cardiac events occurred more frequently among patients with chronic depression but not incidental depression when compared with patients with no depressive symptoms. The American Heart Association recommends "Routine screening for depression in patients with CHD in various settings, including the hospital, physician’s office, clinic, and cardiac rehabilitation center. The opportunity to screen for and treat depression in cardiac patients should not be missed, as effective depression treatment may improve health outcomes (Lichtman et al. (2008)." Total Score= ≥ 3 is suggestive of elevated symptoms of depression. Assessment of depression is an essential part of care of a patient with cardiac disease. Treatment of depression includes antidepressant drugs, cognitive behavioral therapy, and physical activity. Selective serotonin reuptake inhibitor (SSRI) antidepressants, sertraline (Zoloft), citalopram (Celexa), escitalopram (Lexapro), fluoxetine (Prozac), fluvoxamine (Luvox), and paroxetine (Paxil)are recommended for patients with depression and CAD. Tricyclic antidepressants (TCAs) and monoamine oxidase inhibitors (MAOIs) are not recommended because of their cardiotoxic side effects (Glassman et al., 1993). One major side effect of MAOIs has been the occurrence of spontaneous hypertensive episodes. On occasion these episodes have led to a hypertensive crisis (Wimbiscus, et al., 2010; Lavin, et al. 1993). TCAs can cause heart rate increase, blood pressure abnormalities, and serious conduction alterations, including right and left bundle-branch block or atrioventricular block. They are generally at high risk for causing arrhythmias (Kantor et al. 1975; Roose et al., 1987). "SSRIs compared with TCAs leave them the antidepressant drugs of choice in depressed patients with CHD. Nevertheless, clinicians using SSRIs must keep in mind that these drugs may be associated with the serotonin syndrome, tachycardia, arrhythmias, (Fernandez et al, 2007)." Comparisons of SSRI antidepressants with TCAs and MOAIs and their cardiovascular side effects continue to be studied. Large studies such as the one by Spindelegger et al. (2014) of 169,278 psychiatric inpatients showed MOA inhibitors to have the most cardiotoxic effects, followed by tricyclic antidepressants with the least cardiotoxic effects of the SSRI antidepressants. Taylor et al. (2005) examined the effects of antidepressant medication on the morbidity and mortality of 1,834 post MI patients. Mortality or recurrences of MI was significantly lower in patients taking SSRIs than non-users of antidepressants or those taking non SSRI medications. Similar results were found by Mavrides & Nemeroff (2013) in their review of 61 articles about the use of antidepressants with patients with CAD. All antidepressant medications have the same efficacy, side effects and safety profile when used with patients with cardiac disease. Cognitive behavioral therapy or other nonpharmacological counseling approaches may be helpful to cardiac patients with depression. Cognitive therapy is based largely on the premise that thoughts influence moods. Depression can be maintained by constant negative thoughts. These thoughts occur automatically. According to Rozin & Royzman (2001), the human mind defaults toward negativity, paying more attention to negatives than positives. As Baumeister et al. (2001) described, bad is stronger than good. Cognitive therapists hold the patient with depression has negative distortions that can be reframed to a more realistic perception. Statements like I will be unhappy forever can be changed to I am unhappy now because of what happened but improvement is possible. The patient with depression can see a current unhappy situation as temporary and not diminishing the rest of their life or their future (Dekker, 2011). Social support is typically defined as having a spouse, significant other, friends, and/or colleagues who are part the positive and supportive dimension of a person’s life system. Four supportive behaviors commonly are described as part of a social support system: emotional (expressions of empathy, love, trust, and caring), instrumental (actual aid), informational (advice and information), and appraisal (positive and helpful feedback) (Glanz, Rimer, & Viswanath, 2008). Graven and Grant (2013) reviewed 15 studies describing the impact of social support on depression with patients with cardiovascular disease. Eleven studies reported on the positive aspects of social support in preventing or reducing depressive symptoms. Patients with CAD should be assessed for the presence of social support in their life systems. Depression can be a barrier to physical activity needed not only to improve cardiovascular health but also to reduce the depressive symptoms. The American Heart Association recommends 150 minutes a week of moderate aerobic exercise. This would apply to patients in stages A and B with the approval of their physician. Patients in stages C and D should be given exercise recommendations based on their cardiac condition. Some muscle-strengthening activity can also produce benefits (AHA, 2014). AHA (2014). American Heart Association Recommendations for Physical Activity in Adults 2014. http://www.heart.org/HEARTORG/HealthyLiving/PhysicalActivity/FitnessBasics/American-Heart-Association-Recommendations-for-Physical-Activity-in-Adults_UCM_307976_Article.jsp#.V9bc5jWy-M8. Fernandez, A., Bang, S.E. & Srivathsan, K, et al. (2007). Cardiovascular side effects of newer antidepressants. Anadolu Kardiyol Derg. 7, 305–309. Rozin, P., & Royzman, E. (2001). Negativity bias, negativity dominance, and contagion. Personality and Social Psychology Review, 5 (4), 296–320. Spindelegger, C. l. et al. (2014). Cardiovascular adverse reactions during antidepressant treatment: a drug surveillance report of German-speaking countries between 1993 and 2010. Int J Neuropsychopharmacol. 18(4).